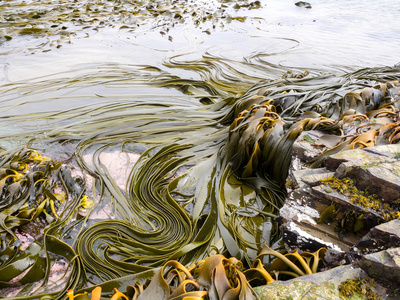 A tangle of kelp on the shores of the Falkland Islands. What about the relaunch of your Floating Forest citizen science project is different than the original 2014 launch? The relaunch of Floating Forests really represents our taking the project to the next level. When we launched in 2014, we were just figuring out how to tap the power of citizen science for kelp forest classification. Now at nearly 3 million classifications later, we have built beautiful time series for Tasmania and California, but, more importantly, we’ve learned a lot about how to build a project that serves high quality images that are both lovely to look at and easy to classify kelp. Working with the team at Zooniverse, we’ve rebuilt our entire image processing system to create images that not only get better quality data, but filter out a great deal of the noise still present in our earlier platform. Delightfully, a lot of what we’ve implemented comes from feedback and even code generated by citizen scientists during our first round. This relaunch is also part of the NASA Citizen Science for Earth Systems Program. We have more targeted goals in this round. We’re starting with the Falkland Islands, as it’s an area whose kelp forests are very poorly explored, let alone do we have any information about how they’ve changed over the past thirty years. It’s also a small enough area that we can shake out any last bugs in our system. We then plan to move on to target kelp forests at the edge of their thermal range limits so that we can see if climate change has pushed those boundaries over the past thirty years, examine how kelp forests have changed around cities as urbanization has increased over time, look at how the dynamics of little explored kelp forests in the sub-antarctic Islands, and so much more. Why are Landsat data useful for finding and mapping giant kelp? Giant kelp forms an immense canopy that sits just on the surface of the ocean. It’s canopy is large enough, however, that it can be seen with Landsat. Dr. Kyle Cavanaugh was able to figure out how to boost the signal sufficiently so that people can classify distinct beds from images. Landsat provides us with an unprecedented record of these forests. Until we were able to use satellite imagery to see these forests, scientists have been limited to very small-scale but regularly collected data by divers and infrequent overflight data. Landsat is a real game-changer in terms of long-term large-scale kelp forest ecology. Have you already been able to gain some understanding of how global change is altering giant kelp thought the Floating Forest project? In the first round of Floating Forests we were quickly able to see the dramatic declines in kelps in Tasmania that Drs. Craig Johnson, Scott Ling, and others have linked to multiple climate change stressors. With the relaunch we’re hoping to focus on specific areas, such as kelp range edges, that will give us a clearer signal of whether climate change impacts are general across the entire range of giant kelp. (Left) A Landsat 5 image acquired in October 2003 off of the Southern end of the Falkland Islands near George Island. You can see beautiful kelp beds along the peninsulas of land jutting out, as well as some more offshore forests where there is a shallower basin. (Right) Kelp beds on the north side of the Falkland Islands in September of 2001. Image credit: Byrnes et al. The NASA Citizen Science for Earth Systems Program funded this relaunch.